Very happy and excited because i received my hair today!Got my hair within 3days... the hair looks like the picture and there is no odo...	Read More Very happy and excited because i received my hair today!Got my hair within 3days... the hair looks like the picture and there is no odour hair smells great. Leaving feedback is very important because reading them was what helped me to buy hair from this company so i hope this will help someone else. This clip in hair is excellent! Color matched! 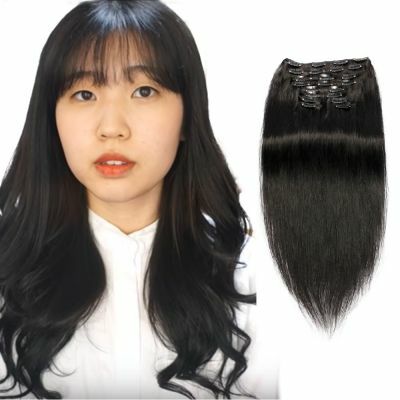 Picked by the picture on the site and the color of their hair in bright light from the t...	Read More This clip in hair is excellent! Color matched! Picked by the picture on the site and the color of their hair in bright light from the top. The length is good! THANK YOU SELLER!!! I love the hair and how soft it is. it came really fast and the communication was excellent. Will order again. Very happy and excited because i received my hair today!Got my hair within 3days... the hair looks like the picture and there is no odo...	Read More> Very happy and excited because i received my hair today!Got my hair within 3days... the hair looks like the picture and there is no odour hair smells great. Leaving feedback is very important because reading them was what helped me to buy hair from this company so i hope this will help someone else. This clip in hair is excellent! Color matched! Picked by the picture on the site and the color of their hair in bright light from the t...	Read More> This clip in hair is excellent! Color matched! Picked by the picture on the site and the color of their hair in bright light from the top. The length is good! THANK YOU SELLER!!! I love my hair.So soft and wavy.Clip in are really nice I love how thick they are and very natural looking.Clip ins shed a little but t...	Read More> I love my hair.So soft and wavy.Clip in are really nice I love how thick they are and very natural looking.Clip ins shed a little but they are great overall.It also curls so beautifully.